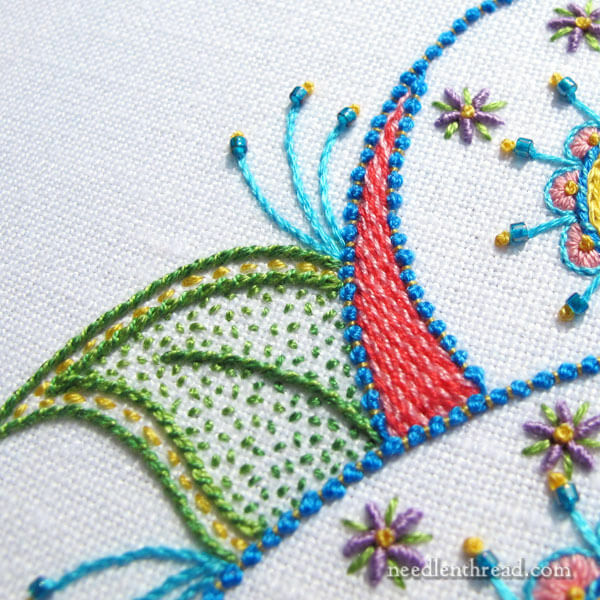 Embroidered Kaleidoscope – Birthday Bash Finish! I finally finished Birthday Bash, my embroidered kaleidoscope in a repeat paisley design. Actually, I finished it twice. Last week, I finished it the first time – or so I thought. I took photos and cleaned up my stitching mess. All the leftover threads were tidied and tucked away; the piece (thankfully still on the frame) was covered and set aside, and the whole thing was, in my mind, complete. All I had left to do was edit some photos so that I could share the finish with you. And then I started editing the photos. It’s amazing what you’ll catch in photos, that you don’t catch in real life! Somehow, I had forgotten all the French knots. So this week, I finished it again. Today, I’ll share the finish with you and a quick run-down on how I interpreted the design, with the why’s and wherefore’s of what I was trying to produce. And then next week, the pattern will be available for those who want to stitch your own interpretation or dabble with the same approach I took. 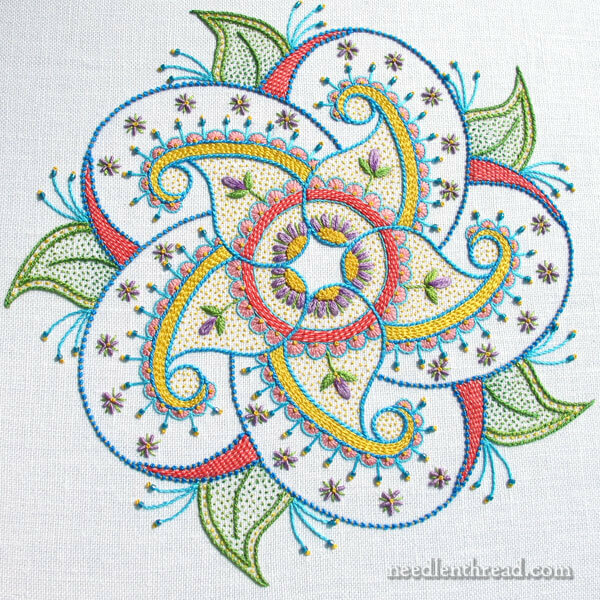 With these types of designs – as with any design you’re working that starts with just an embroidery pattern – ultimately, the interpretation is always up to the stitcher. 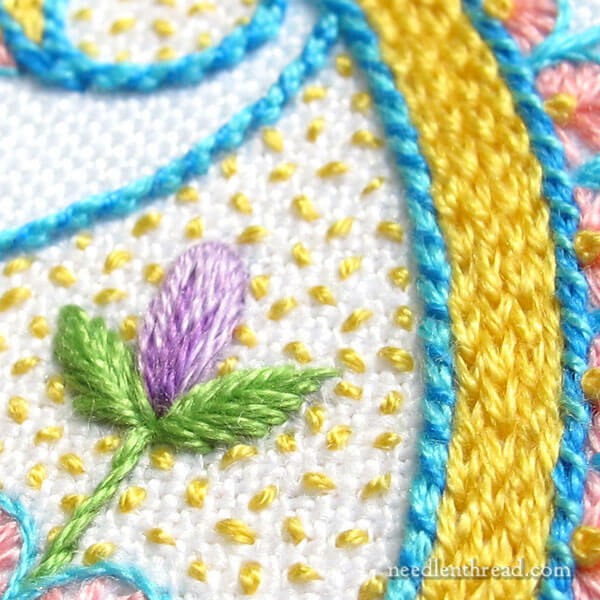 While you might not feel perfectly confident in making your own color, thread, and stitch choices at first, the more you venture into making your own stitching decisions, the more you’ll be able to fine-tune your own embroidery style, unique to you. If you’re not quite there yet when it comes to decisions on interpretation, that’s ok! Working through someone else’s suggestions works great, too! And it helps build the confidence you need to venture forth with your own ideas. I wanted to get across the idea of a birthday celebration, with colors that come to mind when I think “Birthday Party.” Think: sprinkles on cupcakes and brightly colored birthday candles. And I wanted to use a variety of stitches to keep the piece fun to work. In that regard, it turns out to be a sampler of sorts. My interpretation of Birthday Bash finished with a total of 15 stitches and stitching techniques incorporated into the finished design. 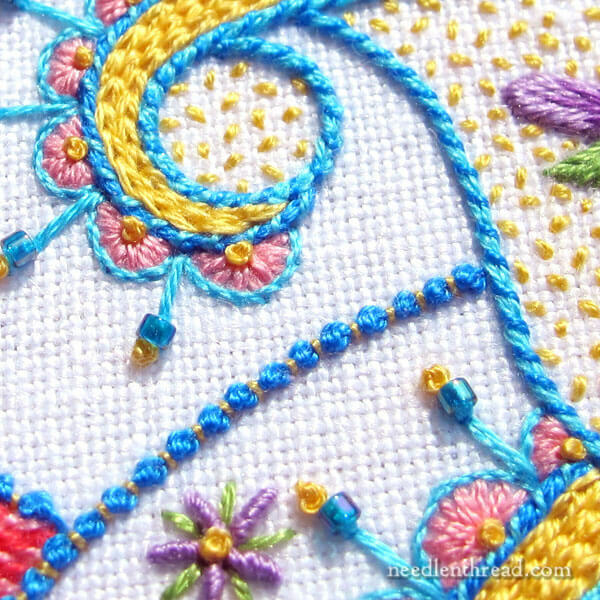 …Palestrina stitch with a couching stitch worked between each knot, bullion knots, and beads for accents. It’s a busy little piece, stitch-wise! I always start a project like this by pulling out the colors I think I might use, and then, as I stitch, I narrow down the colors, or I add a color or shade that I hadn’t originally planned on. Beads: Mill Hill Magnifica beads in color #10104 – I couldn’t find the Myuki delica equivalent, but if anyone knows it, feel free to post it in the comments below! I used two strands of floss for everything except the following, where I used one strand of floss: outlining the pink scallops and inner ring of raised diagonal band with stem stitch; the small purple bud in the center of the paisley in long & short stitch; the yellow couching stitch over the dark blue Palestrina lines the make up the larger swooshes of the design; the whipped part of the whipped chain stitch outlining the paisleys and the larger outer leaves. There’s nothing too difficult about the piece. In a few areas, if you were to interpret the design the same way, you’d want to be mindful of the order of stitching. For example, in the area where the diagonal striped band is used as a filling, you’d definitely embroider the striped band filling first, and then the outline. In areas (like the large leaf above) where whipped chain stitch is worked in closer proximity with other lines of stitches, you’d work from the inside to the outside on the leaf, whipping each chain stitch line as you progress outwards. That way, you don’t run into the other lines of stitches while you whip the chain stitch. While there’s no intricate shading on the piece, I used three different shades of green to fill the larger leaves with seed stitches, working from dark green at the base of the leaf to a lighter green at the tip. It gives a hint of shading, anyway! And here’s the whole thing – Birthday Bash! I wanted to achieve something happy and bright, with a sense of movement (the swirls of the design), and a sense of celebration. I was picturing pinwheels, birthday candles and confetti. Did it come across? Perhaps a little bit! I have the linen and the threads and as soon as your patter is available, I shall purchase it. Thanks so much for sharing this with all of us. I love the very velvet petite in the golden yellow color. It would be gorgeous in a kumihimo bracelet! 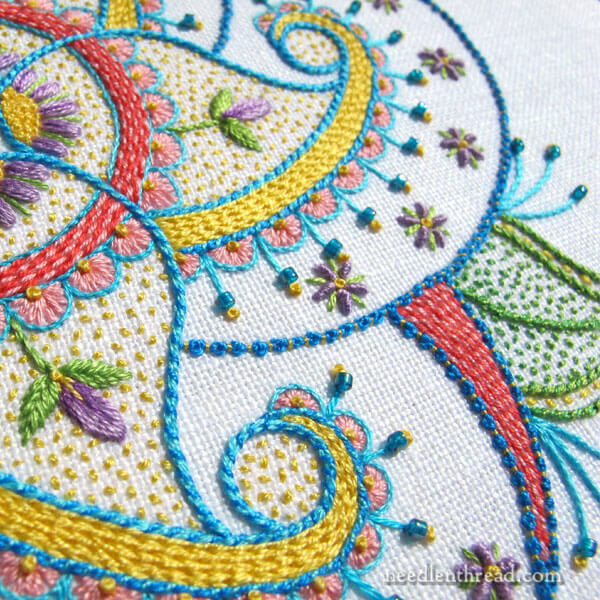 What a gorgeous design, it makes me want to get out my needles and threads and start stitching! (If only there weren’t so many projects waiting to be finished first…) But this wil definitely go on my list of “things to stitch when the stitching bug deserts me” (as it sometimes does) because if this doesn’t get you stitching again, I don’t know what will 🙂 ! I LOVE this design! It is gorgeous! What else can a person say? Good riddance to the Google ads! My blog, not even in the same ballpark as yours, used to get lots of income between it and my eCRATER store. But Google has gone through many changes in the last few years, so that we get less income from ads and because they seem to have this funny idea that even if we don’t sell on Google itself, they can tell us what content we must have, or what we can’t have in our stores. It has all added up for me and many other sellers to about half the sales, or even less, that I used to have and 2-3 times as long to get income from my ads. Great strategy to focus your Google input onto Embroidery books. Relevant and helpful to all of us. Hope it works out well for you too. Love, love, love the birthday bash kaleidoscope, I think you definitely achieved your goal of a light hearted celebration . I can also see in in other colorways, swirling blues for a swirling water effect or lots of other ideas. Bravo – good job! Thank you for letting us know about the amazon links. So now I can support my amazon smile charity AND my favorite blog, even if I don’t buy the embrodiery book featured in the link. Stunning. I love the colours too. This is the first time I’ve see this design in its entirety. I love it! So fun and colorful! I’ve already got design/color ideas swirling in my head with this design. Thanks for taking us on yet another journey as you work through a design, Mary. I think you did a wonderful job in capturing a sense of joy and happiness in Birthday Bash. Well done! So happy to support you by purchasing books via Amazon! Even before I read the rest of your post—when I saw the completed design I thought to myself, “Look at the movement! Like a pinwheel!” Even the five outer leaves contribute to the spin! I love this and I will buy the pattern too, when it’s available. Mary, I left a comment earlier, but just thought of something else. I want My Birthday Bash to look exactly like yours.It just makes me happy. 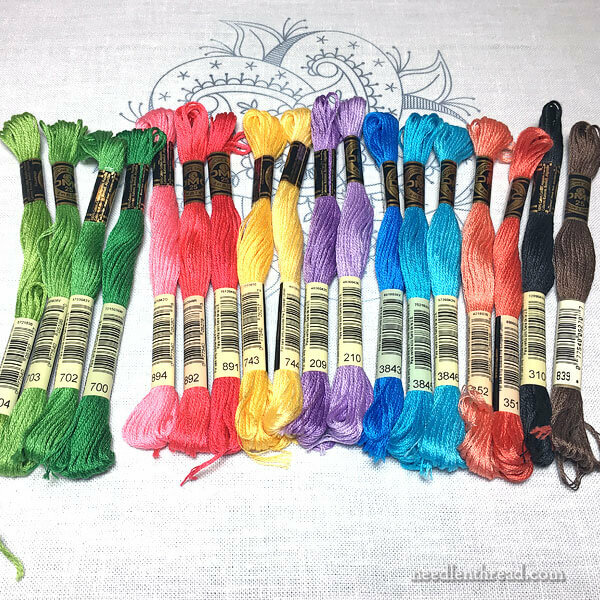 Will you be sharing the thread colors that you used? The stitches I can figure out. Hi, Louisa! Yes, I will! I don’t remember if you have shown the entire design before but it is delightful! Very celebratory and also dimensional with those coral areas. I am wondering about the finished dimensions – I always imagine these so big and they turn out to be such small and fine work. Congratulations on a winner of a design and lovely execution. I can’t wait to get the “Birthday Bash” pattern! I’ve really enjoyed watching you work through it! Quick question. Where do you find the seed beads you use, and do you have any recommendations for what to look for? I’ve always used the Czech glass variety that you can find in a good beading store, but I end up frustrated because the holes are inconsistent and I end up being unable to use 1/3 to 1/2 of them. Does anyone make consistently-sized holes??? I am so glad to read this article. I embroidered every so often as a child and in my teens and twenties. I did very basic embroidery as taught to me by my Mother and Grandmother. I have done many other art things since then (35 years). About 4 months ago I decided to try embroider again and took a beginning class online. I soon discovered I really love embroidery , found your site and it has been my go to site for learning stitches and many other things. I am very thankful for your site and have been trying to think of ways I could support you and your site. I’m so thankful to know going through this link to Amazon is one way. I am a frequent shopper on Amazon so hope I can help you that way. I have loved watching the development of this piece and am so glad it is finished and that the pattern will be available next week. Thank you so much for all you provide to all of us who are working on our skill of Embroidery. ANYwhoo, I love this design! It definitely meets your goals with great movement and a fun, lighthearted feel. And beautifully stitched, too! I tried the coupon at Berlin Embroidery and it said it has expired. Do you think it’s the time difference between Germany and the US? This is a delightful design, Mary! The happy colors are very uplifting. The perfect project to work on this winter. January is always so gray and grim — not to mention cold — and I always start feeling grumpy and blah. This project will be the perfect antidote! Thank you, Mary! re: ads and affiliate links, have you considered using Patreon? I know that I get so much value out of your blog and videos, I’d be happy to contribute monthly. I’m sure I’m not the only one! I’d even be happy to help set it up (though I’m not an expert, just a very happy user of their site). This is so gorgeous Mary, I’d frame it and hang it on my wall like a painting! Whilst I haven’t commented in a while, I do read all the newsletters I receive. As to the ads from Amazon – I think that’s a great idea! Ads I’d actually bother to look at and consider purchasing! Thank you Mary. 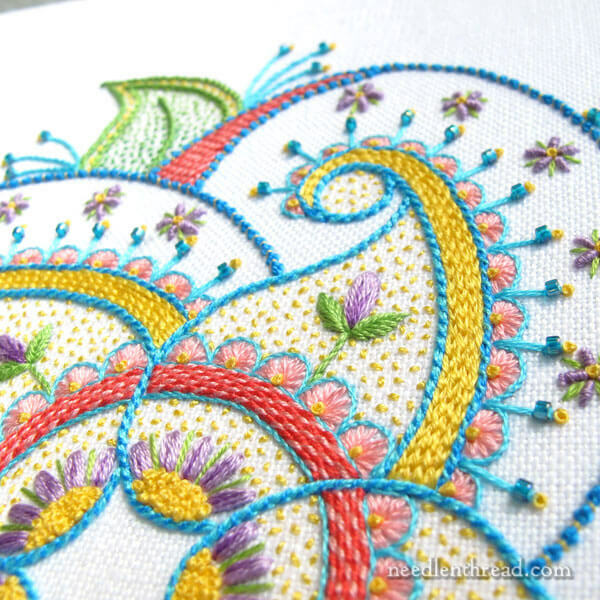 One of the prettiest designs you have ever stitched! Mary, this is beautiful! Now I’ve seen the whole design I can see that your colour choices have been perfect from the start. How could we have doubted you? 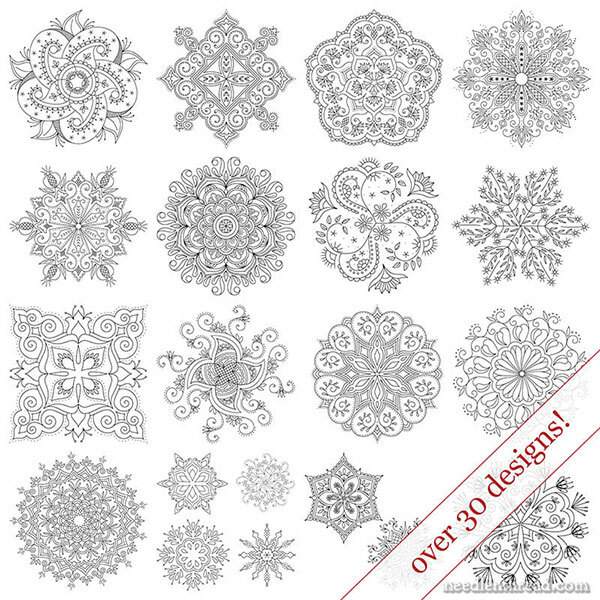 I look forward to buying the ebook of these designs. I’ve never noticed any Google ads, only some needlework-related ads down one side. Maybe my security software blocked them automatically. I have been so looking forward to seeing Birthday Bash finished. It’s stunning and inspirational. And you managed wonderfully to convey you bright, fun, “party” message. It’s a privilege to follow your blog. Thank you! I’m a regular reader of your site which I really enjoy. I just read about the Amazon tie in. When I click on the book link I’m taken to US Amazon. Is there a way you can benefit if I go to the UK Amazon site? Hi, Helen – Thanks for asking! I’m not sure if in different countries can be accessed through the same link, actually. :-/ I’ll definitely look into it, though! Can you clarify for me? I don’t do embroidery myself (although I’m enjoying reading your site!) However, I do purchase quite a bit via Amazon. Do you mean that my purchases would “count” for you if I entered Amazon via one of your links, even though I eventually purchased something other than the book, etc. that you link to? If so, I’d be more than happy to go through your links for all my purchases. Hi, Amy – yes, that’s exactly the case! Thanks for asking! What a delight! It’s as special as I thought it would be. The colors, the stiches, it’s absolutely is a birthday party! Hi Mary, I am loving these new designs and will definitely be purchasing your e-book. In order to get a jump on the birthday bash project, can you share what fabric you recommend for this project? Thank you for a wonderful blog and website!! Your project turned out beautiful. In my opinion you achieved your vision very well. What are the dimensions of the design? Just to let you know, I look forward to receiving your newsletter each week. Thank you for revitalizing my interest in embroidery. Ah, thanks, Adele! The design is about 6.5″ around. Next Next post: News Snips & Thread Winner!